"He's not The Joker — he's Batman." An interview with Scott Snyder at New York Comic Con – AiPT! From the moment The Batman Who Laughs first appeared in DC Comics’ Dark Nights: Metal event last year, fans have both loved and feared him. He’s the DC Universe’s worst nightmare — a Batman that’s completely devoid of morality, absolutely lethal, and only follows one rule: BATMAN ALWAYS WINS. As the events of Metal concluded, the most dangerous man in the multiverse vanished and fans were forced to endure months of uncertainty about the character’s future. 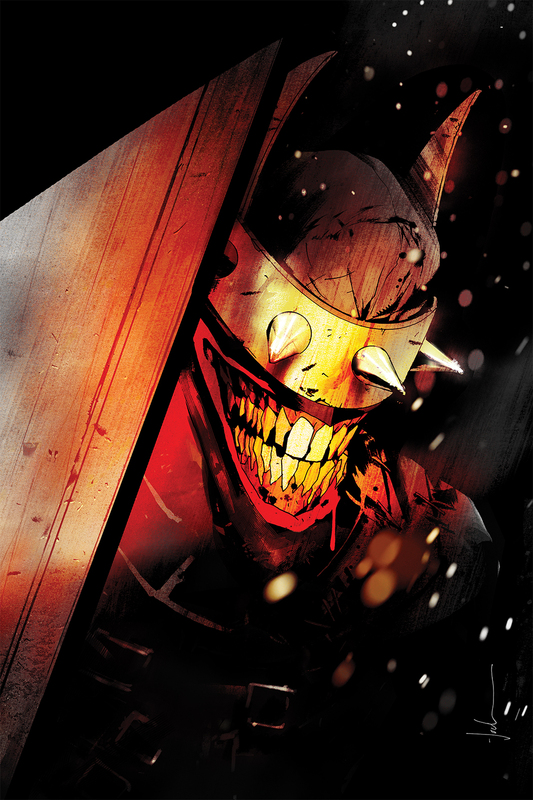 Then, after a torturous wait, it was announced in July at San Diego Comic Con that The Batman Who Laughs would be returning in a six-issue series penned by his creator, Scott Snyder, and drawn by Snyder’s frequent collaborator, Jock. We’ll now get to witness Bruce Wayne facing not only The Batman Who Laughs, but a new Dark Knight as well: the Grim Knight. A Dark Knight forged from the night of Joe Chills’ encounter with Thomas and Martha Wayne, which is Bruce Wayne’s greatest fear and the event that rests at the core of his Batman identity. Ever since this series was announced I’ve been pining for it. I’ve wanted to know how The Batman Who Laughs will address his weakness, I’ve wanted to know more about the Grim Knight’s origin story, and I’ve wanted to see Bruce Wayne confront his greatest fear. Lucky for me, I was able to catch up with Scott Snyder at New York Comic Con over the weekend and ask him about a few of my most burning questions. AiPT! : I’m a huge horror guy and something that I always like to ask people who write horror is, what are you afraid of and how do you use it to influence and inspire your stories? Snyder: I love horror because I feel like when it’s done right, it’s almost like conflict burned down to its purest form where the drama is you are up against your worst fears personified: in a monster, in the world, fears about yourself, the external universe what’s going to happen — all of those things. Good horror to me is a pure, honest version of conflict. So for me I think some of the biggest things I worry about is what the world is turning into for my kids. Before I had kids I was very worried about myself. Was I a good person? Was I a bad person? My mortality. I think you can kind of see that in a lot my early stuff. Now I worry a lot about what we’re leaving them. Who we are to them. What kind of dangers they’re in because the world has changed. So I try and address those things. Justice League is all about that. It’s literally about the world cracking open with the source wall breaking and the universe sort of falling apart and the question of “Who we are going to be in the face of that?” If it looks totally hopeless in terms of fixing it, are we going to just try and get ours and celebrate our inner villains the way Luthor thinks we should? Or are we — even in the face of hopeless odds — going to band together and at least go down swinging as good people? And hope that we maybe find a way out of it. So that’s Martian Manhunter and League and so on. Horror for me is that. Even when I write Superman I think of myself as a horror writer where I’m trying to find what am I most afraid of and how do I then give it to these characters in a way that’s organic to them and then put them up against it in a way that makes me brave as a writer. Hopefully it inspires. AiPT! : On discussing your fears, that’s what I loved about the Dark Knights so much — they each represented a fear of Batman. So when I think about Batman and his greatest fear, knowing that the Grim Knight is coming and knowing his ties to Joe Chill, would you say this Dark Knight is the most dangerous foe he’s ever faced because it represents his greatest fear in the death of his parents? Snyder: The Batman Who Laughs, to me, is his greatest nightmare, and the greatest challenge that he will face in a Dark Knight is the Grim knight, the Punisher Batman. Just to be clear, he’s not a character that we’re trying to celebrate with his violence and lethality and all of that stuff. He is Bruce’s nightmare because he is essentially Bruce having gone down that slope, to the absolute illogical or logical extension. The Punisher is a character who has weapons and goes around in a van, where Bruce Wayne is the head of a multi-billion corporation with a military industrial complex behind him. So he has stuff in your phone, in the joints of your house that does the air conditioning, he has stuff in your GPS in your car. If he wants to kill you your car will just go off a bridge and you’ll never know he did it. So he’s just the most lethal, almost Iron Man possible. AiPT! : Man. [laughs] That’s dark stuff. Snyder: Yeah it definitely is. It’s definitely a horror book. AiPT! : James Tynion’s The Batman Who Laughs was one of the best one-shots, and one of the darkest DC Comics I’ve read in years and I loved it. I’ve re-read it like ten times. AiPT! : I believe it was issue #8 of Justice League where The Batman Who Laughs said to Lex, “You are talking to a Batman,” and we know the Grim Knight is coming and you’ve spoken a lot about Bruce. I feel like The Batman Who Laughs heavily leaned into The Joker aspect of his duality all throughout Metal, so will you be focusing on the Batman aspect of his duality during your six issues? The scary thing about The Batman Who Laughs to me is not the jokes, the laughter, The Joker aspect. It’s the fact that you’re going against a Batman and Batman knows a hundred ways to take you down, kill you or lay you low. And this Batman is lethal and this Batman, all he thinks about is Batman always wins. How do I win? That is it. It’s that taken to its absolute extreme. AiPT! : So on that point, The Joker revealed to him, The Batman Who Laughs, his weakness at the end of Metal. He said “The only thing you could never imagine is Batman and I working together.” So are we going to see The Batman Who Laughs address that? Because the way I see it, he’s just as much a villain for Batman as he is for Joker. And you could see how much offense The Joker took to Luthor working with him. Snyder: Oh yeah. You might see that in the very first issue of The Batman Who Laughs. Batman Who Laughs might literally come after both Joker and Batman and they might have to team up. You might see some really startling crazy stuff happen between Joker and Batman and some shocking, both I think friendships and conflicts. Or friendships and antagonisms formed in that series between Gordon, maybe James Gordon Junior, maybe some other characters we’re bringing back, as it’s the spiritual successor to Black Mirror. But we want to go all out with it. I want that series to be the scariest darkest Batman thing I’ve done. Yet one thing I’d say if I can say one last thing, is that all the stuff we’re building I want to feel individuated. I want you to feel like you can read Justice League and not read Justice League Dark, not read Odyssey, not read Batman Who Laughs. But, if you read them all, you will see that we planned when we did: Metal, No Justice, Justice League — all three books, Batman Who Laughs, another book that they’re announcing in a month that’s coming very soon, that’s going to pick up some of the pieces of Batman Who Laughs, and then rolling into the summer then into fall, you’re going to see something very big that culminates all the stories — the source wall, the Totality, everything like that. So I would just say, as much as each thing is standalone, it’s all part of one giant meta story that Josh, James and I have been building with other writers as well — Bendis, Tom, from early 2017 all the way through now. Let me say again, officially to you guys. We really appreciate Adventures in Poor Taste. You guys are awesome and have been so supportive. AiPT! : One last quick question. There are a million theories about this on the internet: how does The Batman Who Laughs see through a spike plated visor? For the answer to my final (and very important) question to Snyder, click here to continue.